- Long press the K1 button, the camera would shake once and both red and blue light are on. After the device finishes initializing, the blue light would be off and red light keeps lighting. Now it enters standby mode. - When the device is on, long press the K1 button, it would shake once and the red light turns off after flashing 3 times quickly. Then the camera would shut down successfully. - The camera would shut down automatically if it keeps in standby mode for 2 minutes. - When the camera is in standby mode, short press the K2 button, the blue light would be on, red light off, and finishing a snapshot after a shake. Then re-enter the standby mode(blue light off and red light on). - When it is in standby mode, long press the K2 button, the camera would shake 2 times and the red light turn off after flashing 3 times. Then it starts video. Short press the K2 button, it would finish and save the video. Then re-enter the standby mode(blue light off and red light on). Hidden Camera: Fashion design, look just like an ordinary USB flash drive. No flashing during recording. Not easy to be detected, the best secret camera for recording or surveillance. Great Quality: 640 x 480 resolution ratio, and 1280 x 1024 picture format. Support motion detection recording. Plug and play, no software installation required. Recording Assistant: Convenient for meeting and class recording, easy to operate, portable and unnoticeable design, high capacity battery can support 120minutes record. Multi Functions: Snapshot, video recording, webcam and TF card reader. High quality monitor, protect personal privacy and information confidential. 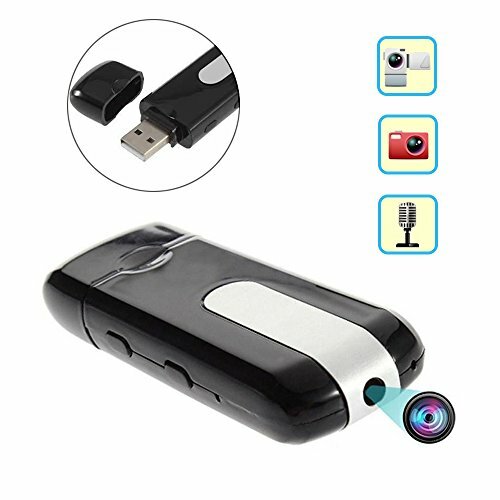 Memory: This spy camera doesn't have the internal memory. It supports 32 GB TF card max (Memory card isn't included). View More In Video Surveillance. If you have any questions about this product by Cainda, contact us by completing and submitting the form below. If you are looking for a specif part number, please include it with your message.